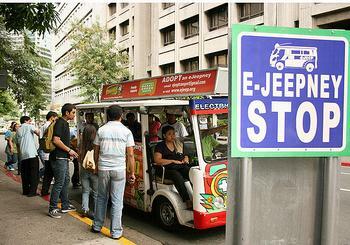 MAKATI, Philippines, February 29, 2012 (ENS) – The first commercial electric jeepney service in the Philippines was launched in Makati City on Monday through franchise-holder EJeepney Transport Corporation. The Land Transportation Franchising and Regulatory Board earlier this month granted EJeepney Transport franchises for 21 eJeepneys – 10 units to serve the Legaspi Loop and 11 units for the Salcedo Loop. The electric jeeps will start picking up passengers starting March 1 and the francise license will continue in effect for five years. The new electric vehicles can carry 24 passengers and can run as fast but much more cheaply than petrol-based public utility vehicles. An eJeepney charged for eight hours can run 70 kilometers (43 miles) a day. The ejeepneys are locally fabricated and assembled in the Philippines by PhUV Inc., the business arm of the Motor Vehicle Parts Manufacturers Assn. of the Philippines. They are equipped either with a 5 kW, 72-volt electric motor or with a 7 kW, 84-volt electric motor. Jeepneys are the most popular means of public transportation in the Philippines. Originally made from U.S. military jeeps left over from World War II, they are known for their colorful decoration and crowded seating. One of the 17 cities that make up Metro Manila, Makati is the financial center of the Philippines and one of the major financial, commercial, economic, cultural and entertainment hubs in Asia. Mayor Jejomar Erwin Binay expressed his delight over the approval of the franchises which have been pending with the LTFRB for years. He said the city government has been eagerly awaiting the franchises and finally securing them is a source of great pride for the city. “Makati is the first city in Metro Manila and the country to operate electric vehicles for public transport, and this is enough reason for the city government to celebrate. I firmly believe that through this initiative, Makati is contributing much to the reduction of carbon emissions that contribute to global warming and the changing climate,” Mayor Binay said. “In time, we will be expanding the fleet of eJeepneys in Makati City so that we can slow down, if not reverse, the devastation of the environment through carbon emissions from fossil fuels,” said the mayor. A senator, a local chief executive, transport groups, the private sector, and civil society gathered to celebrate the historic launch event organized by the nonprofit Institute for Climate and Sustainable Cities, the country’s policy think tank on sustainable energy solutions and fair climate policy and an eJeepney pioneer. “What we are launching is not just the first plug-in eJeepney commercial franchise, but the rapidly growing community pushing for green solutions,” said the Institute’s Director Red Constantino. “We may be the first to hold the commercial franchise, but what we want is to have more green operators replicating the initiative all over the country,” said Yuri Sarmiento, CEO of the EJeepney Transport Corporation. “For small operators to shift to eJeepneys, we need to show them that it is commercially feasible for them, for the drivers and the commuters in the long term,” said Sarmiento. “This launch above all is an invitation to the public, the Makati commuters to continue supporting the eJeepney, to prove that sustainable transport solutions and green enterprises are viable in our country,” Constantino said. Senator Ralph Recto, author of the Alternative Fuels Incentives Bill pending in the Philippine Senate, also attended the eJeepney launch event. Also known as Senate Bill 2856, the Alternative Fuels Incentives Bill aims to provide policy support and incentives to vehicle operators and manufacturers to accelerate the development and deployment of low-emission vehicles in the country. Electric jeepneys were the brainchild of Green Renewable Independent Power Producers, Inc. in partnership with Robert Puckett, president of Solar Electric Company in the Philippines. 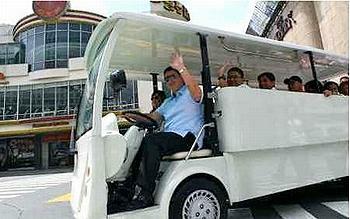 Four eJeepneys began testing on Makati streets in 2007, with a few more added in 2008. There are also 10 eJeepneys in Iloilo City located in the Western Visayas region. They are operated by the city government and carry students and senior citizens during weekdays for free.